The zesty fragrance will energize, refresh and lift spirits every time. Invigorating warm oil hand soak that transforms into a milky moisture bath. Lustrous hand masque with citrus essential oils and grape seed oil. Silky-smooth hand and body lotion that contains citrus essential oils, grape seed oil and black tea extract. Citrus SPAMANICURE® products bring a burst of energy to hand treatments. 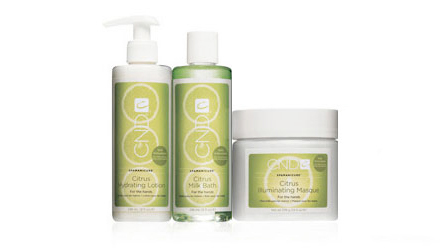 CND® Citrus SPAMANICURE® supplies offer hands a freshly squeezed dose of nutrients and moisture. Citrus Milk Bath starts the treatment off in an invigorating way, with grape seed oil and a blend of lime, orange, and lemongrass essential oils. The Citrus Moisture Scrub can be used next. This polishing treatment features a blend of citric acid and grape seed oil, with finely-milled mineral salts for gentle, effective exfoliation. Our lustrous Citrus Illuminating Masque is ideal for the next stage of treatment with these manicure products. Citrus essential oils and grape seed oil help reduce visible signs of aging, with help from a firming peptide complex. Citrus Hydrating Lotion offers a silky-smooth finish – essential oils and black tea extract impact skin in a beautiful way.